*WEC Meeting: Please come join us in our work to enhance our Island’s watershed. May 5th at 3 pm, at the Heritage Trust Resource Center. We will be planning for LI Ferry Landing Phase II /2011-2013 and organizing spring work parties to maintain our Ferry Landing Enhancement efforts. *We are anxiously waiting for word from the National Fish and Wildlife Foundation/ Community Salmon Fund on our $49,000 grant application. We have permits in hand and hope to continue our restoration work around the Ferry Landing and Northern public shoreline. Thank you to all of you that helped make Phase I happen. There is life in the plants along the ferry landing. This year we‘ll see growth. We hope this and our other work will improve the quality of storm water runoff entering our clam beds. *See our information table at the Civic Club Expo/ Plant Sale, April 30th, Lummi Island Grange Hall. Haven’t signed up to be a shore Steward yet, here’s your chance. Cheryl Lovato-Niles will have an official Shore Stewards Table there as well. Thanks for using the Mitt Mutt Stations on the Island there to help you clean up after your pet! For information or to volunteer contact: Wanda email: forestflor@aol.com, Blog: https://liwec.wordpress.com and FB Page: https://www.facebook.com/LIWEC. We all want healthy aquatic resources! This is an interesting article about a study on how bio-diversity helps remove toxins in water. Cardinale’s study, which appears in the April 7 issue of Nature, was funded by the National Science Foundation. Scientists have long known that ecosystems that have more plant species tend to have a greater capacity to remove pollutants from soil and water than do ecosystems that have fewer species. But, until now, no one knew how or why this is so. Cardinale’s study helps solve this mystery by explaining how biodiversity promotes the self-cleaning power of streams. According to the study, as algae grow in streams and produce more biomass, they incorporate into their bodies some common forms of pollution and thereby remove it from the water. Each species of pollution-removing algae has evolved and adapted to a different set of conditions, and so occupies a unique mini habitat, or niche, within a water body. Therefore, as the number of species of pollution-removing algae increases in a stream, so too does the number of unique niches that are occupied, filtered and cleansed by them. Hence: the more algae species a stream has, the more total pollutants these organisms may remove from the water. Read More: Precedent-Setting Evidence Of The Benefits Of Biodiversity. beach to the north of the terminal. Section 04, Township 37 North, Range 03 East. Whatcom County Shoreline Management Program (SMP), Title 23, Section 23.60.02.2.P states that a public or private project of which the primary purpose is to improve fish or wildlife habitat is exempt from the requirement to obtain a Shoreline Substantial Development permit when the project has been approved in writing by the Washington State Department of Fish and Wildlife (WDFW) as necessary from the improvement of the habitat and appropriately designed to accomplish the intended purpose. A Hydraulics Project Approval (HPA) is also required from WDFW. It has been determined that the enhancement activities are consistent with the above referenced exemption and applicable policies and regulations of the SMP. The requested Shoreline statement of exemption is approved subject to the attached conditions. Note that pursuant to Section 23.60.15 the applicant or any opponent of this determination may appeal this administrative permit decision to the office of the Hearing Examiner. The application for appeal from the Shoreline Administrator’s decision may be obtained at the Planning and Development Services Office. Such an appeal shall be filed within twenty (20) calendar days of this determination. Note that obtaining a shoreline statement of exemption for a development or use does not excuse the applicant from complying with any other State, regional, or Federal statutes or regulations applicable to such development or use. 1. The proposed project shall be consistent with the site plans and scope of work approved by this Statement of Exemption. 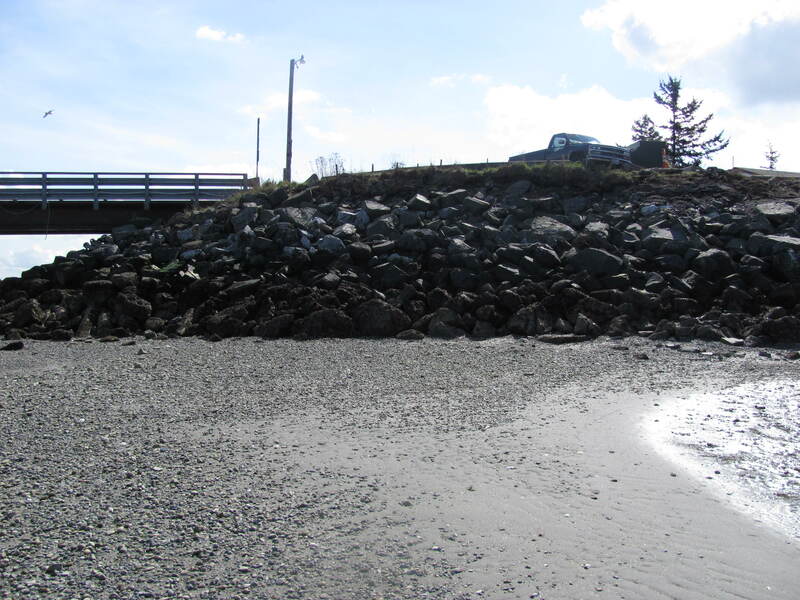 Any alteration of the approved project proposal shall require additional review by the Whatcom County Shorelines Administrator. 2. All work shall be conducted consistent with the Revocable Encroachment Permit (ENC2009- 00157) issued by Whatcom County Public Works – Engineering Services Division. 3. The applicant shall contact the Washington State Department of Fish and Wildlife (WDFW) to obtain a Hydraulics Project Approval (HPA) or any other approvals as determined by WDFW. A copy of the HPA shall be submitted to the Shoreline Administrator prior to starting work. 4. The root wads shall be placed a minimum distance of ten (10) feet from the ordinary high water mark(OHWM) of Hale Pass and be done without impacting existing buffer vegetation between Nugent Road and the OHWM. 5. If archaeological materials (bone, shell midden, cobble tools, etc.) are observed during site work, work in the area of discovery shall cease and the Whatcom County Shoreline Administrator (676-6907) LNTHPO (384-2298) and Washington State Office of Archaeology and Historic Preservation (360-586-3065) shall be contacted immediately to determine the significance of the discovery. If human remains are observed, the Whatcom County Sheriff (911) and LHTHPO Department (384-2298) shall be contacted immediately. Compliance with all other applicable laws pertaining to archaeological resources is required. 6. Development shall commence within two years of the effective date of this Shoreline Statement of Exemption.